The problem is related to automount and autofs. I suspected the configuration file(s) might be corrupted. The configuration files I know are autofs.conf, auto_master and auto_home and they reside in the /etc directory. I checked these files and they were fine. These files did not have information about NFS mount. I was puzzled at first and was wondering where the configuration files were for NFS mounts. The /Local/Default in the error message does not represent an actual directory in the file system. My quest of searching for the corrupted NFS mounts configuration files continued. I spent a lot of time browsing through pages and pages about automount, autofs in OS X. Most of them told you how to do NFS mounts, which I already knew. None of them told you where the configuration files were for NFS mounts. Finally, I came across this post about autofs. The article mentioned this directory led me to solve the problem. Recall that Directory Utility stores its entries as XML files in /var/db/dslocal/nodes/Default/mounts. I fired up the Terminal program and checked the directory. Sure enough, I found the configuration files for NFS mounts. Each NFS mount was saved as an XML file in this directory. One of the files was corrupted. After I modified the configuration file, the share was mounted correctly. 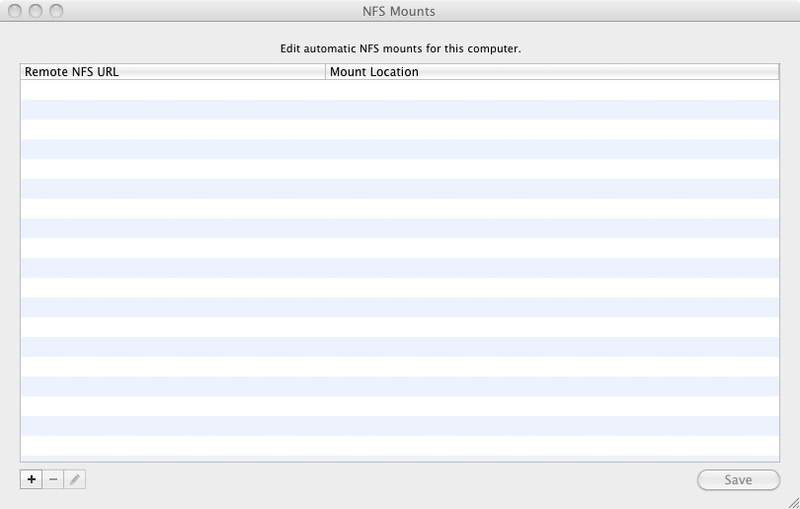 This brings up a new way to manage NFS mounts for your Mac clients. Apple only provides you with the GUI tool to add NFS mounts. If you have quite a few mounts to add, it could become a very tedious process. What you could do to save time is to copy the NFS configurations to this directory: /var/db/dslocal/nodes/Default/mounts. There is no need to run the Disk Utility and mount the shares manually.